Yes, you can! In fact, a Swiss, Michael Dieterle, is already doing it (http://www.natur-pflege.ch/wsb/pages/willkommen/impressum.php). And, its is pretty straightforward: Old livestock races tend to be better in eating wild plants than industrial livestock races. As efficiency in meat production was the primary goal for the breeding of modern industrial livestock races, they are often accustomized to eating processed food. In contrary, old races will eat everything they can find on a meadow, heath etc. Thus, they are ideal when it comes to mowing the lane. In fact, they are even better than machines (when it comes to environmental friendliness). The irregularity with which they do their job, leaves a field of many different micro-habitats. Thus, when the plants regrow a larger diversity of plants will regrow in comparison to a mechanical cut field. Is this the only reason why they are more environmentally friendly. Nope, the cause lies far deeper. Cultivation of landscapes with goats, sheeps and others goes so far back in Europe and the middle East that cultivated areas transformed into stable habitats. When nowadays left untouched by humans (and their livestock), cultural landscapes will not transform back into forests during an observable time span. Quite in contrary,the exact number and consequences of the interactions are still object of scientific study (the study of cultural landscape). 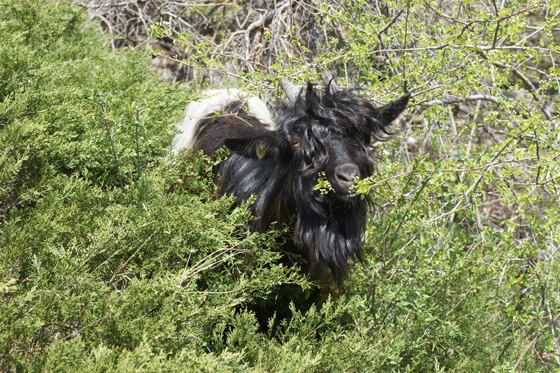 However, as a general rule, a steady utilization of this areas by allowing goats and sheeps to graze on them increases their levels of species diversity and makes them more robust.